Heritage walk and tour organizer Unhurried.in’s first ever food trail at Basavanagudi, one of Bangalore’s oldest localities, had foodies like me making a beeline to Vidyarthi Bhavan, the famous restaurant in this part of the city. 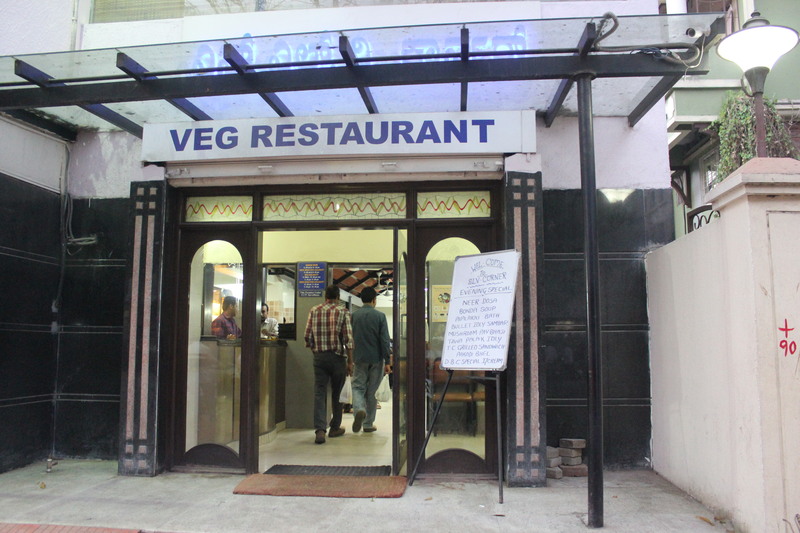 Situated in the midst of the famous Gandhi Bazaar flower market, this eatery is very popular and is one of Bangalore’s oldest. Not surprisingly it was chosen as the starting point of the food trail. 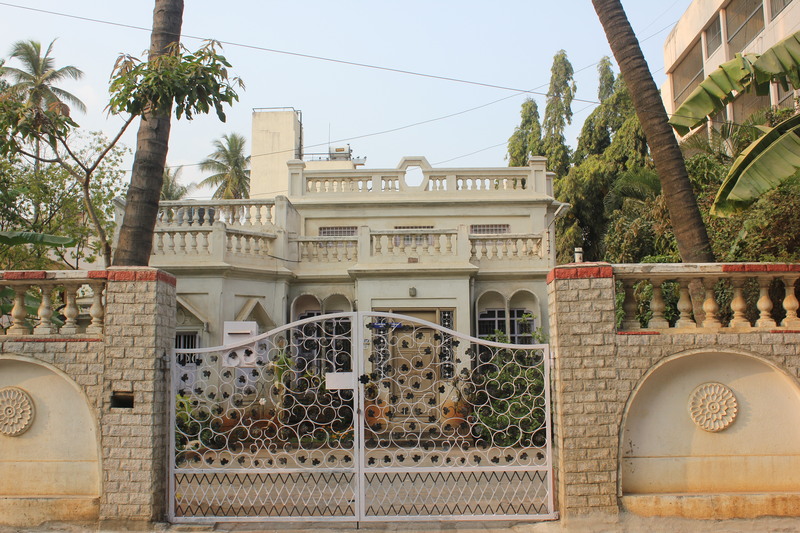 The leader of the food trail was Mansoor Ali, an architect, foodie, heritage enthusiast and a long-time Basavanagudi resident. Listening to Mansoor’s enthralling talk on the Basavanagudi of the past, on the benches outside Vidyarthi Bhavan, served as an awesome starter to the multi-course feast that was to come. We were all shown a lot of photographs and paintings of the Basavanagudi of yore that he had stored on his smartphone. There were a lot of sketches of the Kempegowda Tower and Bull Temple. 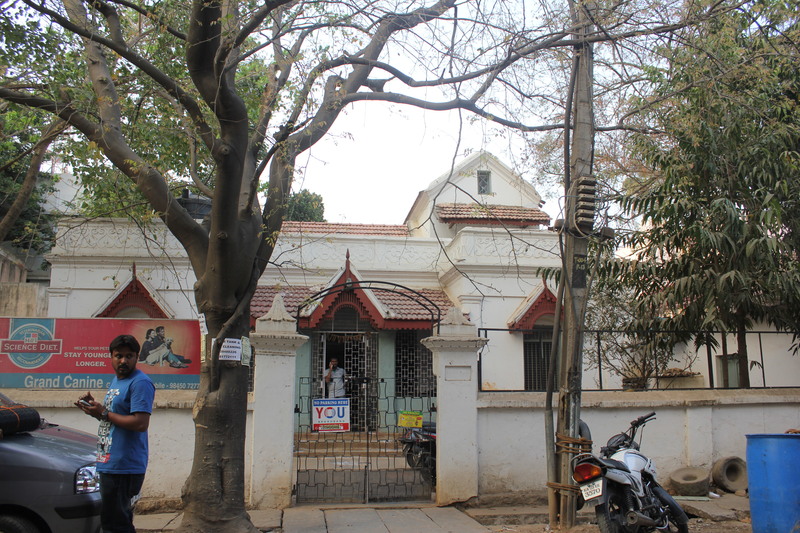 Unlike the Kempegowda Tower at Lal Bagh, entry to the Kempegowda Tower at Basavanagudi is now barred as it is now part of a private property. 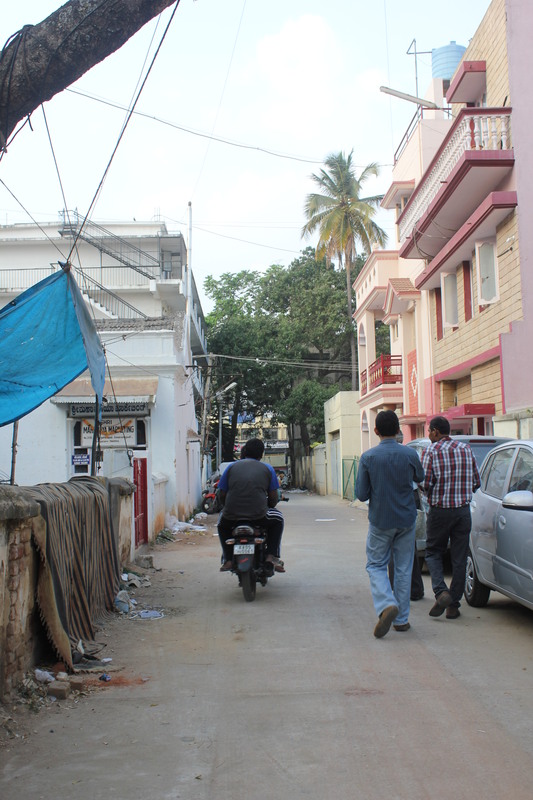 Once a congested locality in the Pete area of Bangalore, Basavanagudi was transformed into a well-planned layout by a British architectural team led by Standish Lee in 1892 after an outbreak of plague in the region. The part of Gandhi Bazaar area from Vidyarthi Bhavan to somewhere near Makala Koota stands on the dried up bed of the Karanji Lake, which was once the lifeline of the region. 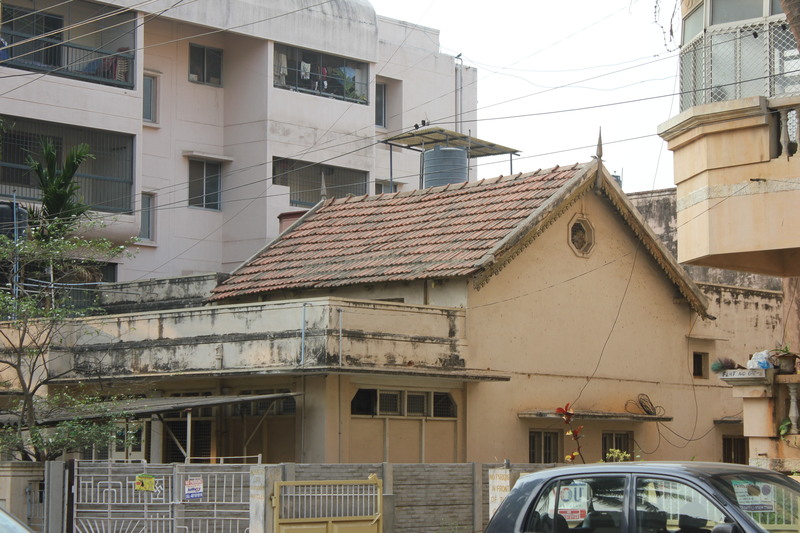 Gandhi Bazaar was earlier referred to as Angadi Beedi because it only had shops. 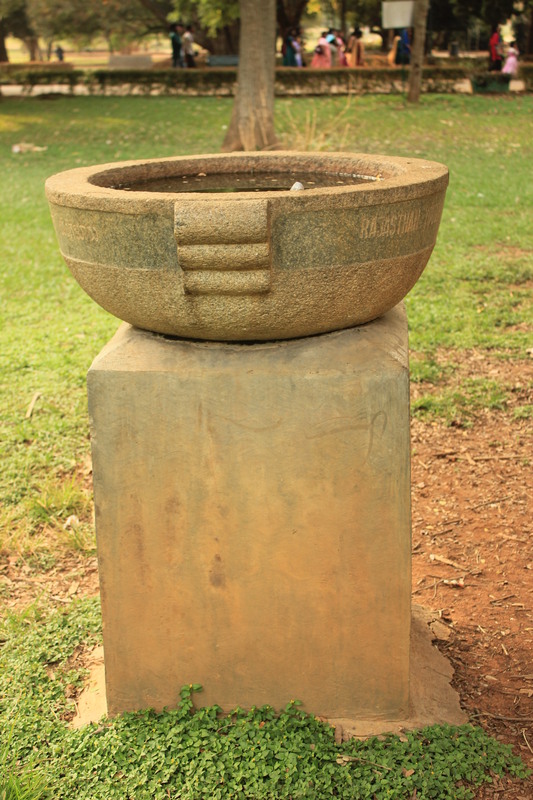 Brahmins formed the largest percentage of population in Basavanagudi. Prominent Bangaloreans who hailed from Basavanagudi include Masti Venkatesa Iyengar, DV Gundappa, MN Krishna Rao, GR Vishwanath, BS Chandrashekhar, and H Narasimhaiah. As we entered Vidyarthi Bhavan, our eyes caught sight of the innumerable portrait sketches on the walls. 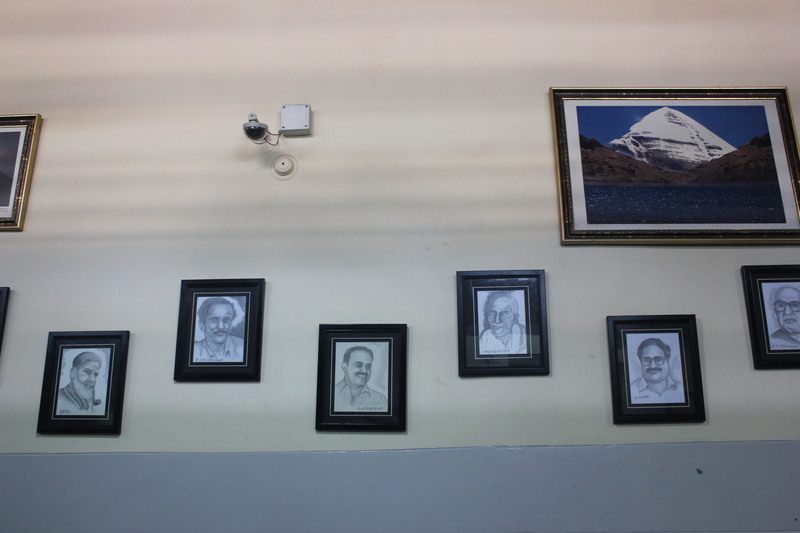 They are sketches of eminent past and present citizens of Basavanagudi and dignitaries who visited the eatery since it started operations in 1943. The artist who drew them, Vishnumurthy was once a cook at Vidyarthi Bhavan. 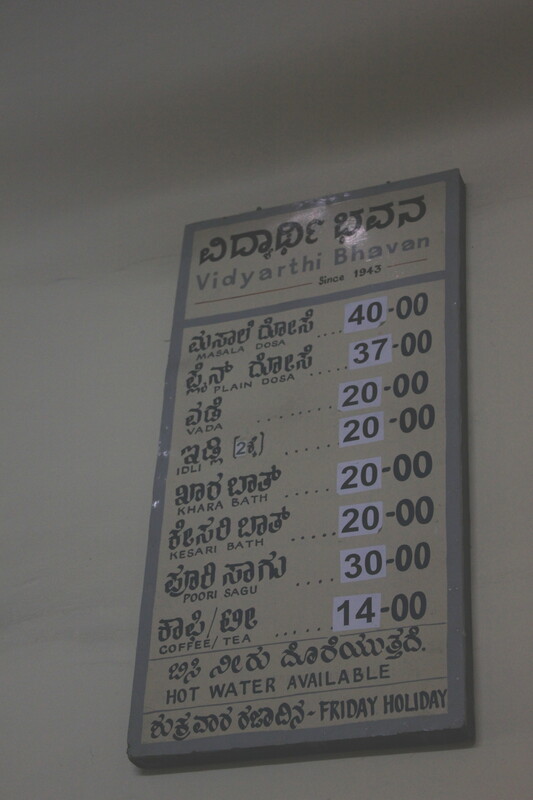 Though Vidyarthi Bhavan officially started operations in 1943, the eatery is believed to have been functioning as early as 1930. It was started by the Adiga brothers and still belongs to the same family. 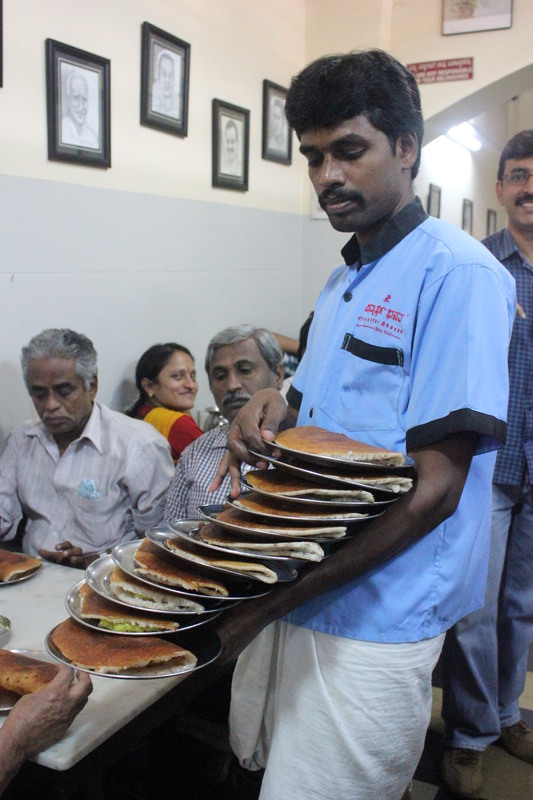 Vidyarthi Bhavan is famous for its masala dosas, by-two coffee culture and the artistic manner in which waiters carry plates of dosas. The menu card isn’t very large here, there are only 8 items on offer. Vidyarthi Bhavan is closed on Fridays. There is a nice story to it. India got Independence on 15 August 1947 which was a Friday. The restaurant remained closed on that day to celebrate the great moment in the country’s history. From then on Friday was the official off day. 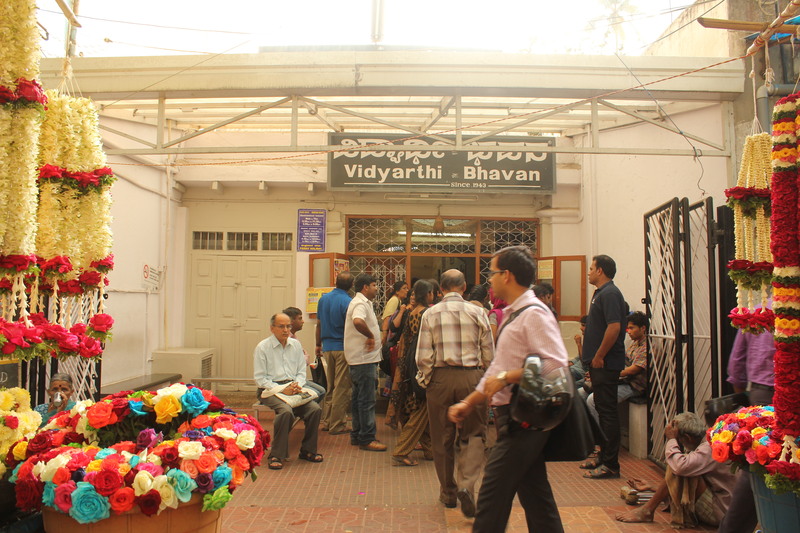 After a round of snacking at Vidyarthi Bhavan, it was time to move on. 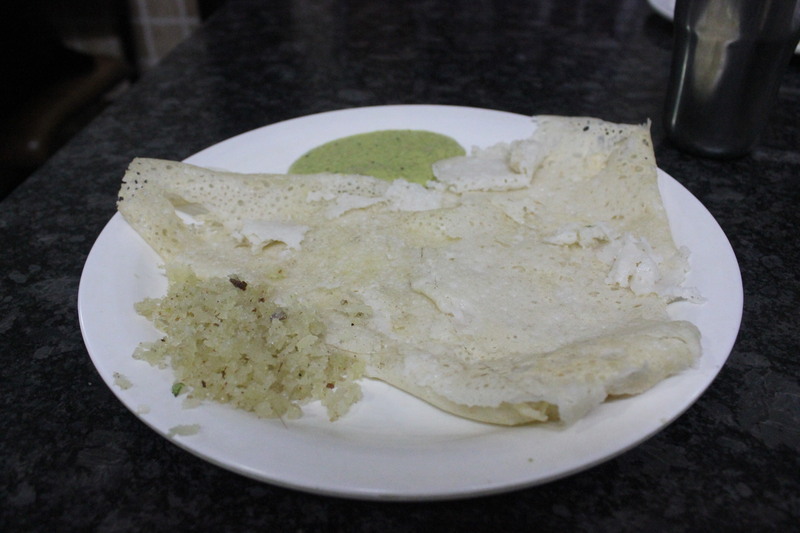 I enjoyed my plate of Masala Dosa. 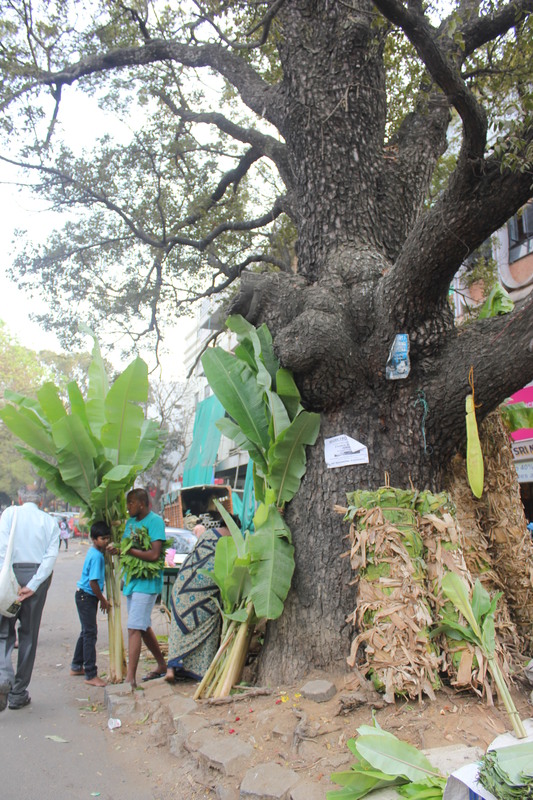 As we moved outside, Mansoor nostalgically recalled that more than a decade back Gandhi Bazaar road was skirted by tall trees on both sides. The canopy formed by the trees was such that there was a lot of shade. Sunlight could only trickle in. In the evenings when the birds returned to their nests, pedestrians usually carried an umbrella else they would have bird poop on their heads. 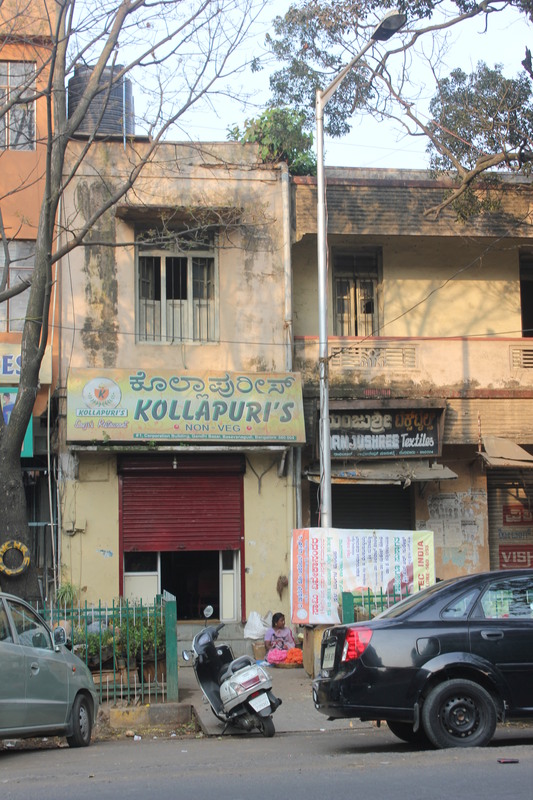 Gandhi Bazaar road also has Kollapuri’s, once the only non-veg joint in Basavanagudi. Our next stop was the Adyar Anand Bhavan, a stone’s throw from Vidhyarthi Bhavan, and a comparatively new joint in this part of the city. 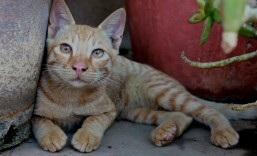 I managed a click just before one of the staff told me that photography was not allowed here. 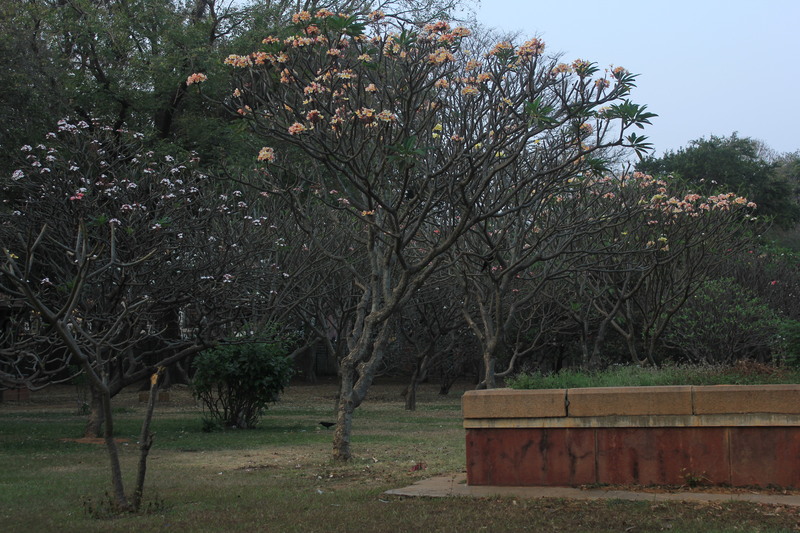 As we walked on we savoured views of some of the last remaining heritage bungalows on the road. 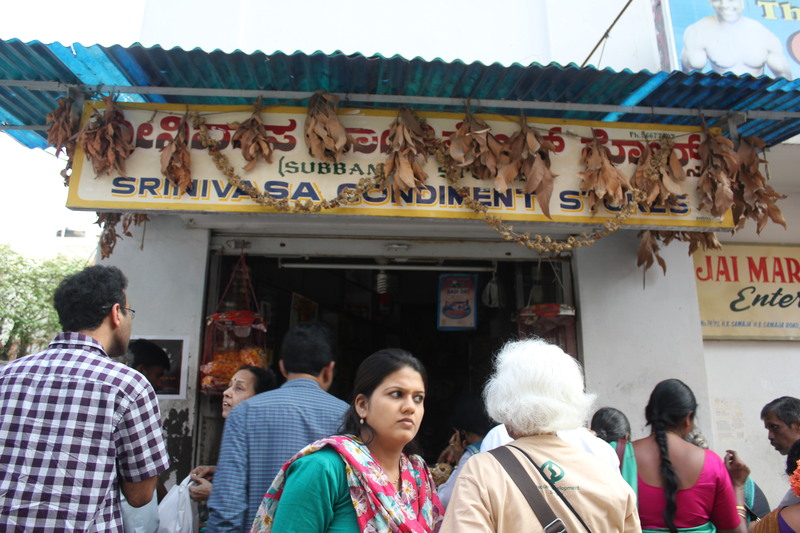 Srinivasa Condiment Stores which was earlier called Subbamma Stores is one of the oldest condiment stores here. The stores which was started by a lady called Subbamma is popular for the assortment of masalas it offers besides snacks like Congress kadalekai, Communist kadalekai, Computer kodubale, all kinds of mixtures and more. As part of Unhurried’s package we were asked to pick up a snack of our choice. 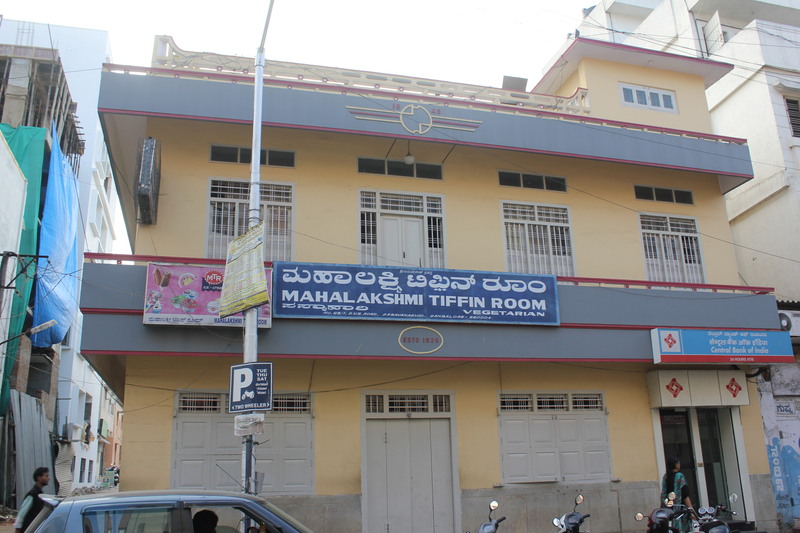 We had a brief stop at Mahalakshmi Tiffin Room. It was closed as Saturday is a holiday here. Food is no longer served on the first floor. Once upon a time, the hotel practiced caste segregation. 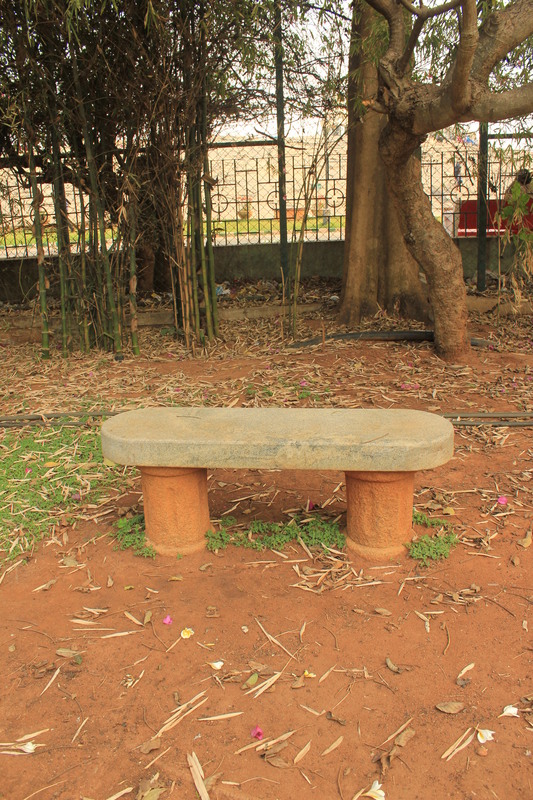 Brahmins would sit in a separate section. Food was served in a very traditional manner and on the floor. There were no tables, one had to sit on small wooden platforms. As we walked on, there were more bungalows to admire. The many conservancy lanes were a reminder of the travails of the scavengers. 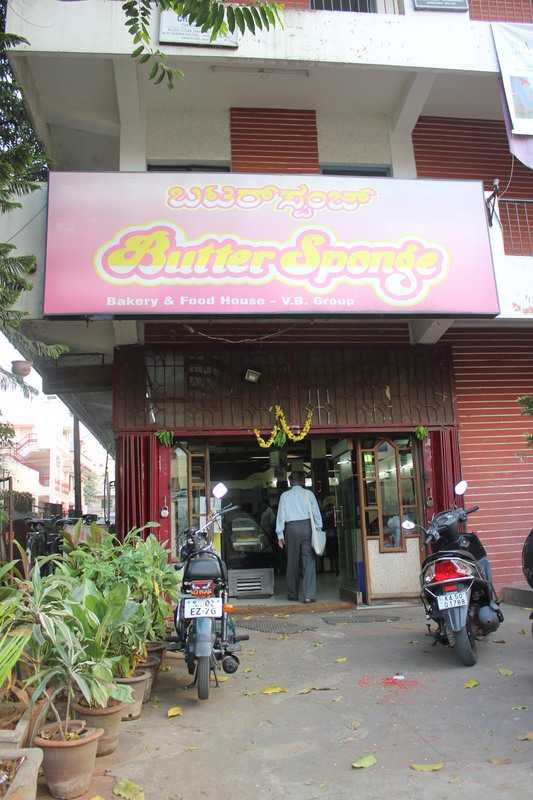 Butter Sponge, opposite National College, which started in the 1980s is a unit of the the famous VB Bakery at Sajjan Rao Circle. The grub here is very reasonably priced. 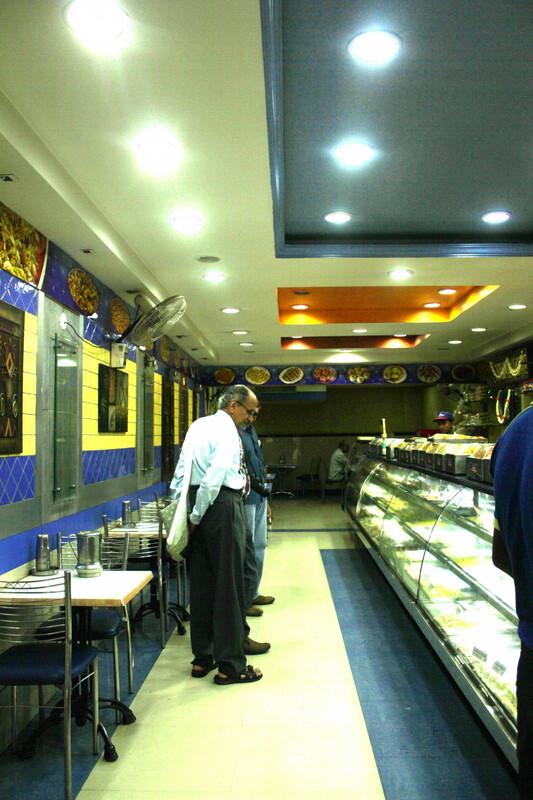 Not surprisingly, the bakery is frequented by students of National College and other colleges in the vicinity. The Saturday speciality here is the Damrod, a delectable pumpkin preparation garnished with raisins and cashewnuts. The Japanese cakes offered here also vanish fast from the shelves. There are lots of other goodies too like Swiss rolls, doughnuts, burfis, breads and more. After sampling the Damrod, our next stop was the famous Brahmins’ Coffee Bar. 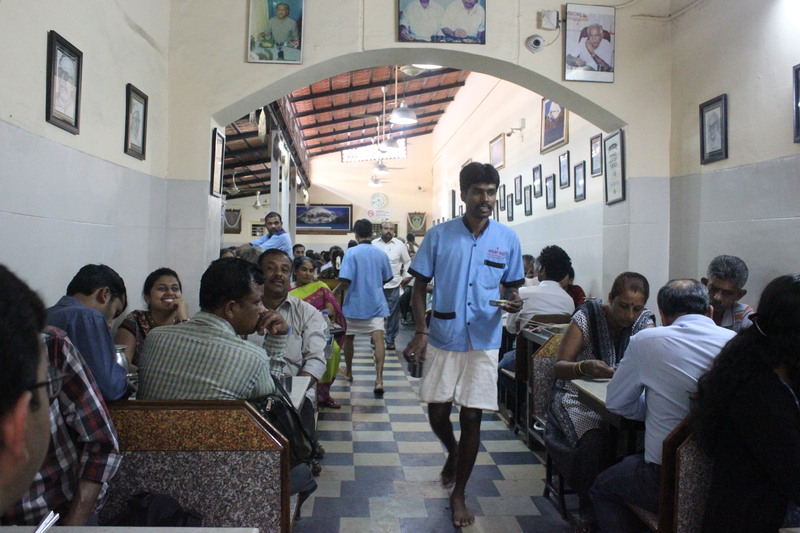 Brahmins’ Coffee Bar is famous for its soft idlis and crunchy vadas. 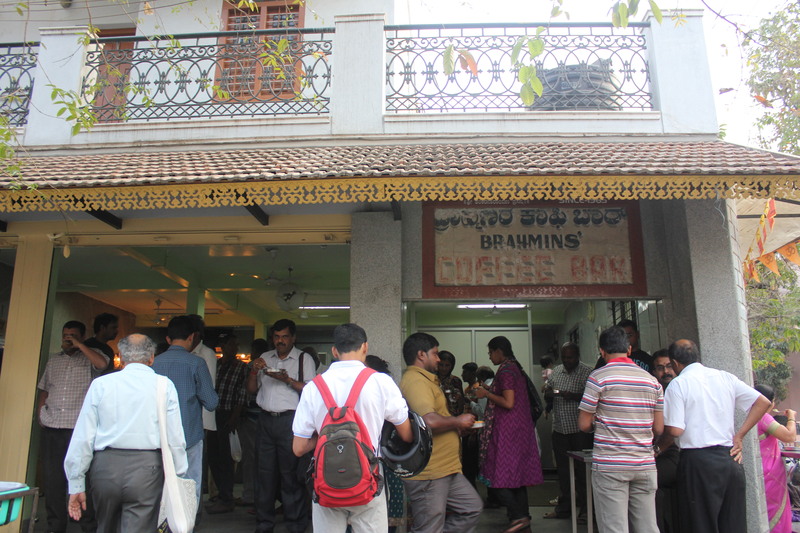 When it started, Brahmins’ was a very tiny joint and people had to stand on the pavement and relish their food. 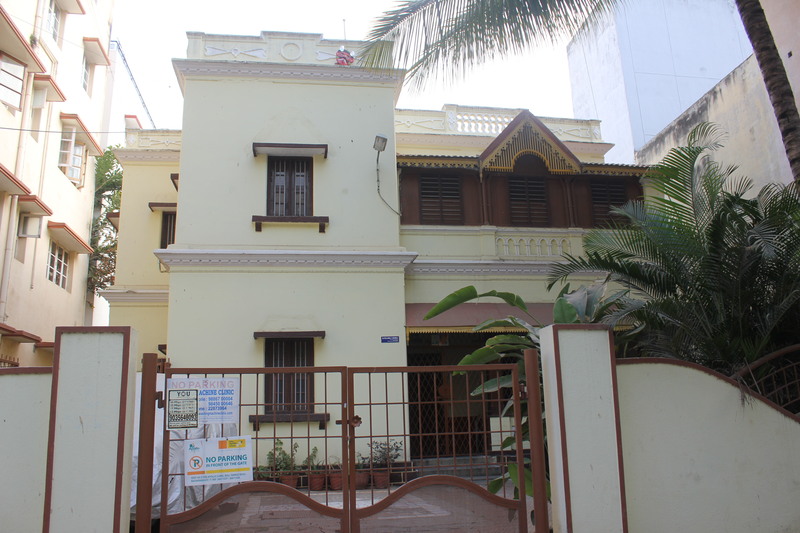 This place too belongs to an Adiga family though not the same one which owns Vidyarthi Bhavan. The recipe of the vadas and idlis was invented by a lady of the Adiga family known for her impeccable cooking. Since it was a busy day, we couldn’t get to talk to the owners. True to their reputation, the idlis and vadas tasted great. 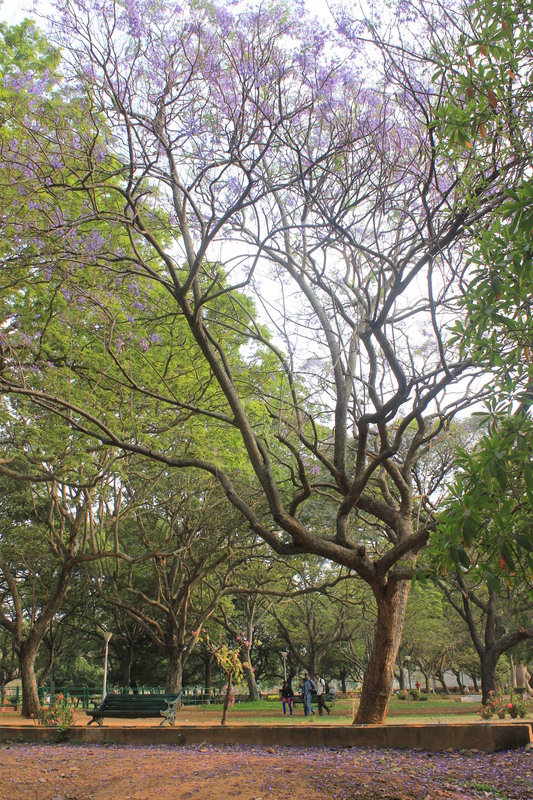 On a February afternoon stroll through Lal Bagh, I was in for a pleasant surprise. 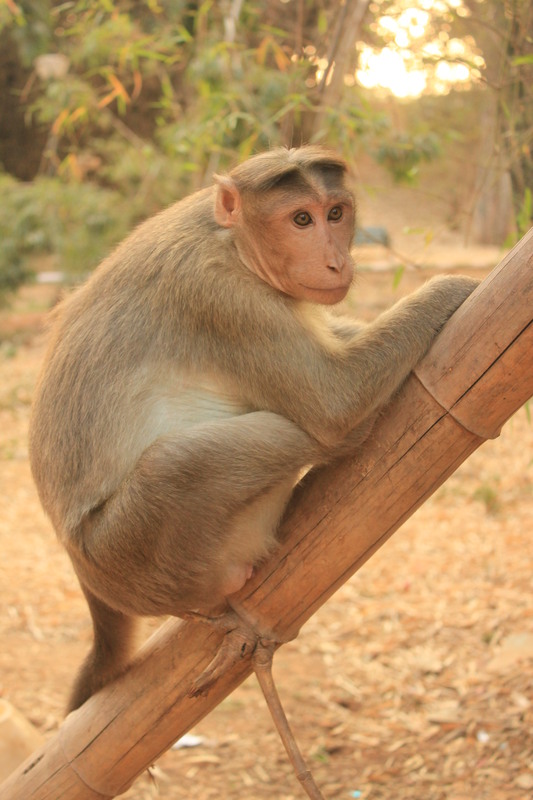 On reaching the Bamboo Grove near Lal Bagh Lake, I saw a group of noisy monkeys running hither and thither. In spite of the risks involved in taking pictures of monkeys (they could run away with your camera or hurt you), I somehow cannot resist the temptation of aiming my camera at a group of hyper-energetic and naughty simians. 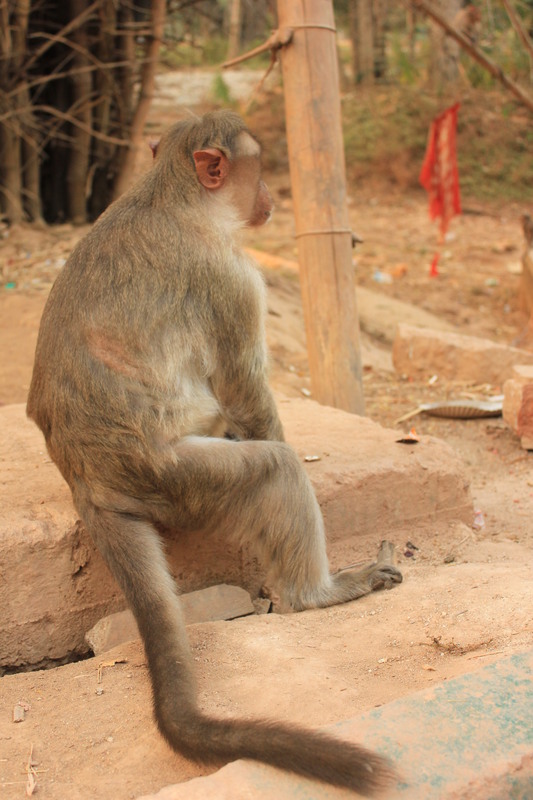 Even as some monkeys were busy with various games, there were some others munching food. A few minutes later, a man emerged from the opposite direction with a white sack on his back a la Santa Claus. No sooner had he approached the grove, all the monkeys crowded around him. A couple of them perched on his head and a few of them started tugging his shirt and some his pants. 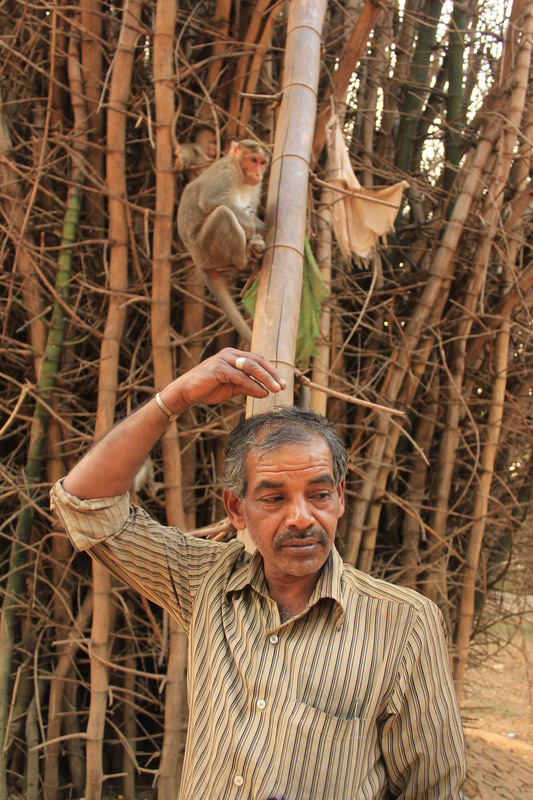 The man seemed unperturbed and it looked like he was speaking to the monkeys. From where I was standing he seemed to be telling them, “Hey guys, relax”. 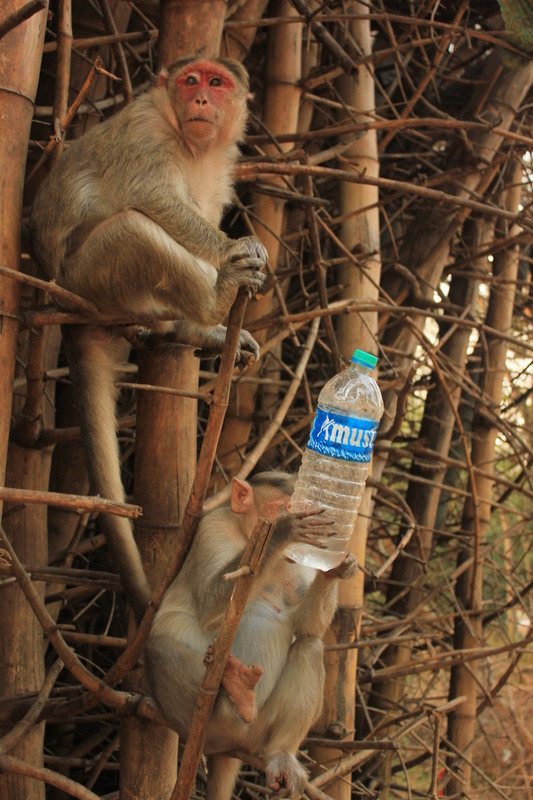 He was carrying food for the monkeys and he also had a water bottle with him. He started feeding them and how! He would just pull out a handful of grains from his bag and stretch out his palm; the monkeys would lick all the grains from off his palm. 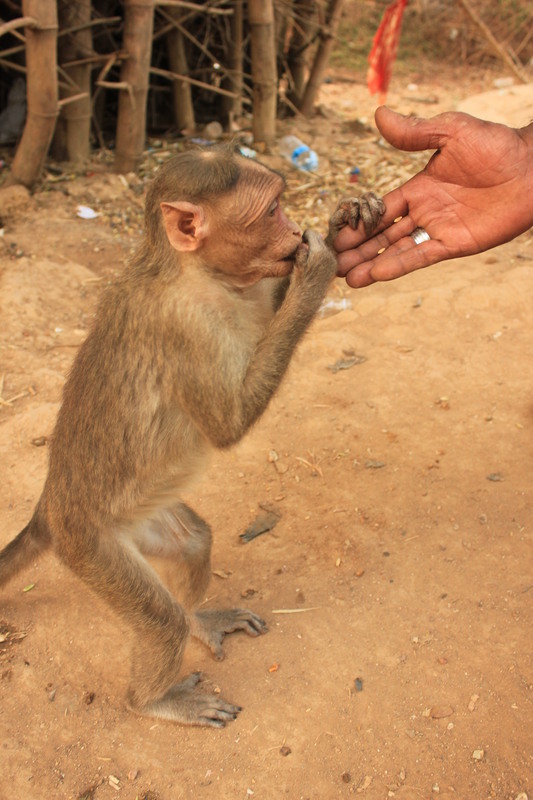 Just as I watched in bewilderment, the man beckoned to me, “Madam come, these monkeys are tame and harmless.” He sounded very convincing. 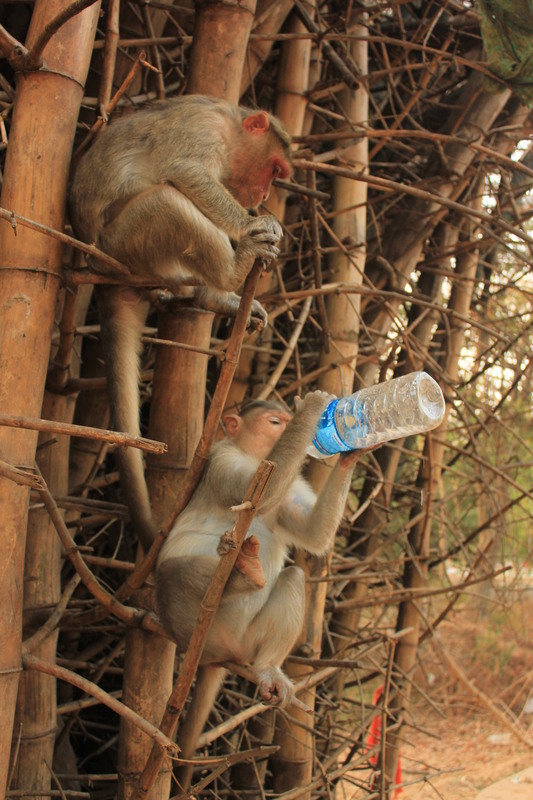 I must say I got carried away and went very close to the monkeys and started taking pictures. I was really excited. 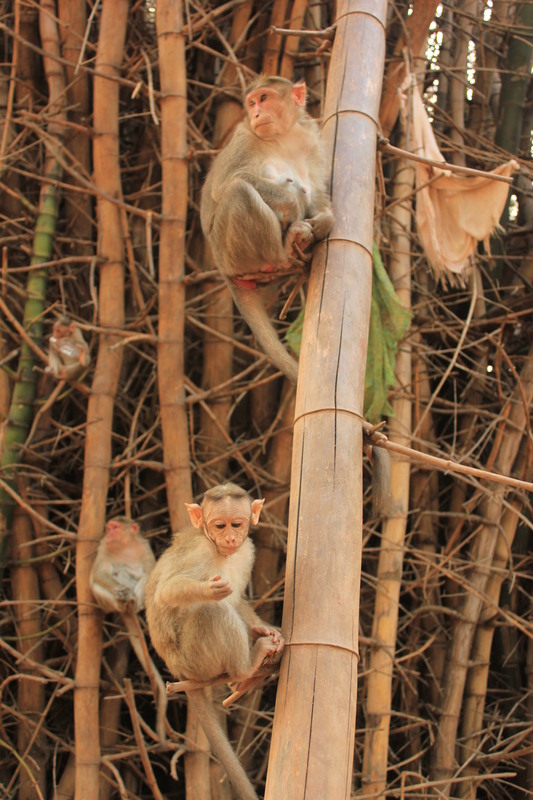 I had never been so close to monkeys. To my amusement, one of them gave me a hug, another one sat on my head. Some of them were babies. 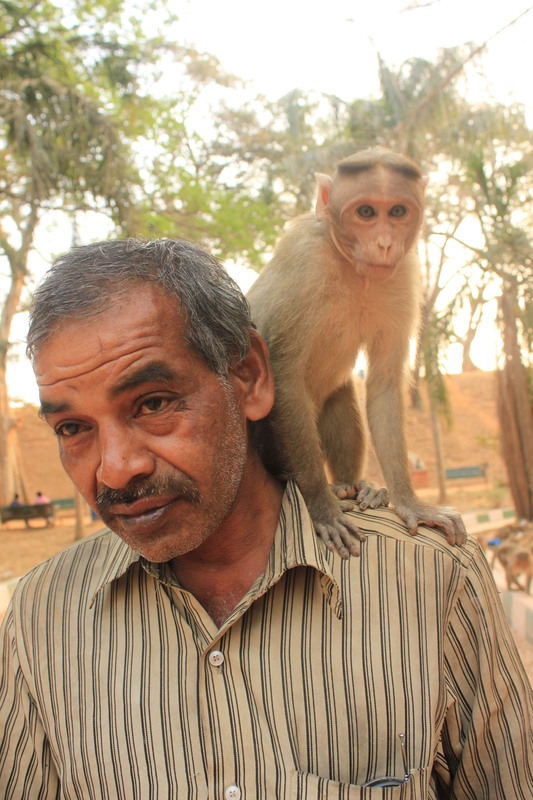 I asked the man who introduced himself as Shivshankar how he managed to befriend these monkeys. 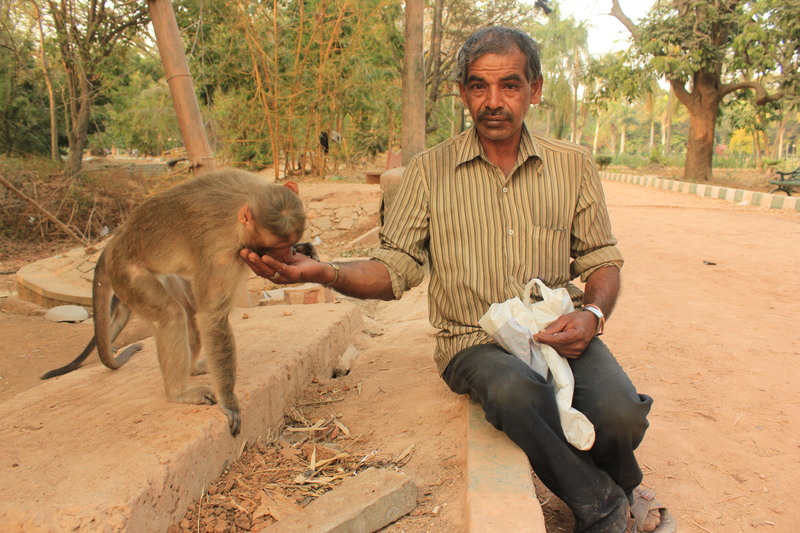 He said that he has been coming to the grove for over a year and feeds the monkeys in the morning and in the evening. “You can find me here anytime between 6am and 10am and then between 4pm and 6pm”, he said with a quizzical expression. 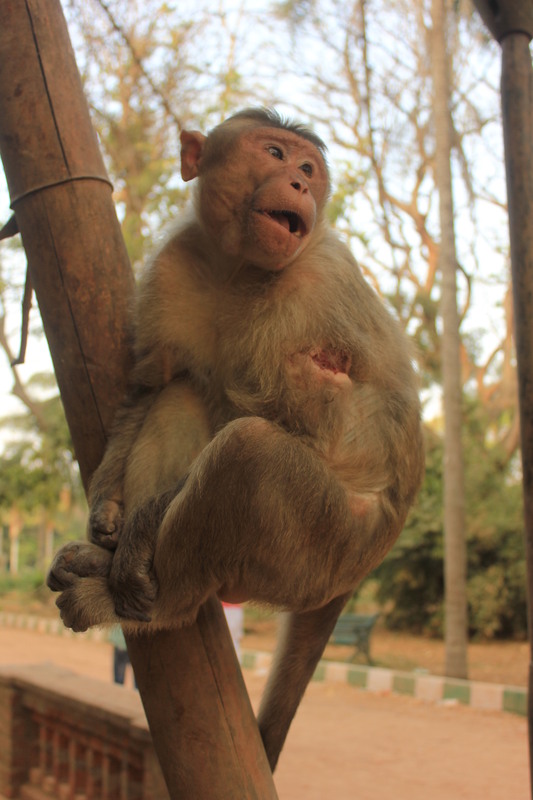 Boss, the monkey with an injury on his arm. Madam with her little one. Shivshankar also has names for all the monkeys. 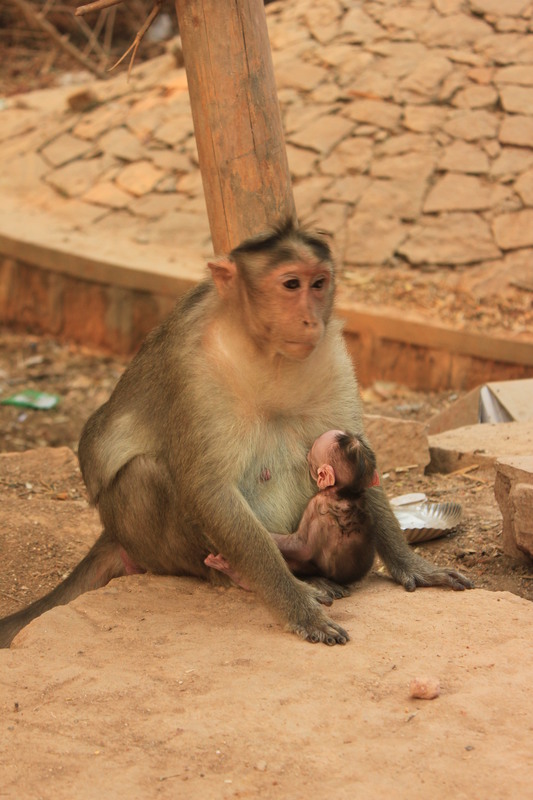 A big fat chap is Boss, a plump female monkey carrying a little one, is Madam. I noticed that Boss has a deep cut in his arm. 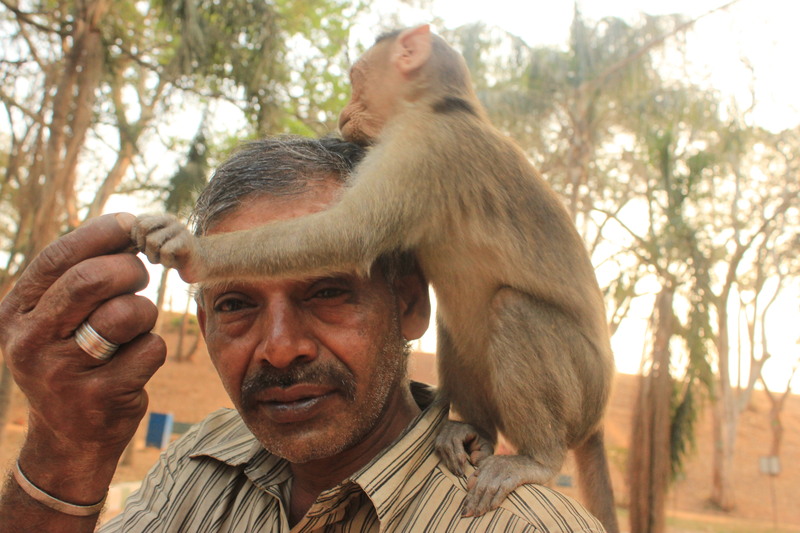 When I pointed that out to Shivshankar, he said, “Yeah, the monkeys sometimes fight among themselves.” He then added that the little one that Madam is carrying was delivered early in the morning. “The baby is not even a day old,” he said with a smile. Shivshankar is a resident of Mavalli, near Lal Bagh, and ekes out a living working as a plumber, electrician and also various other small jobs. 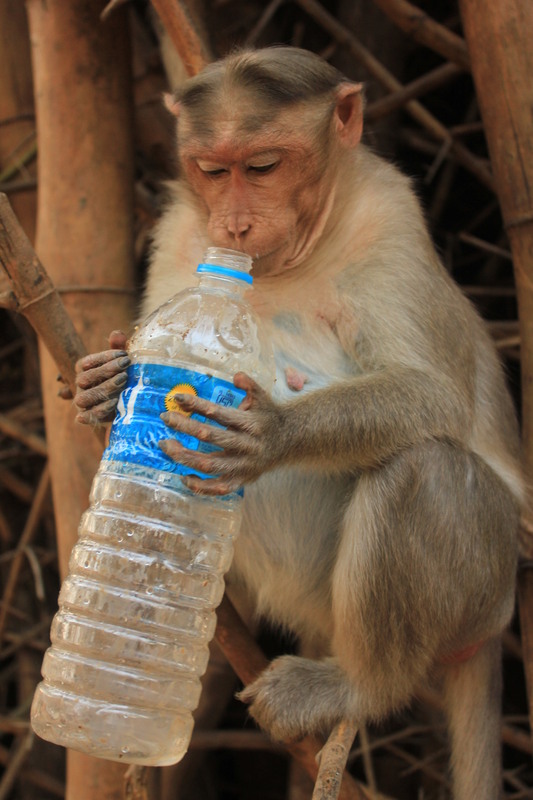 The water bottle he was carrying was also for the monkeys. Each of them took a turn sipping water from the bottle. They even knew how to open the bottle! 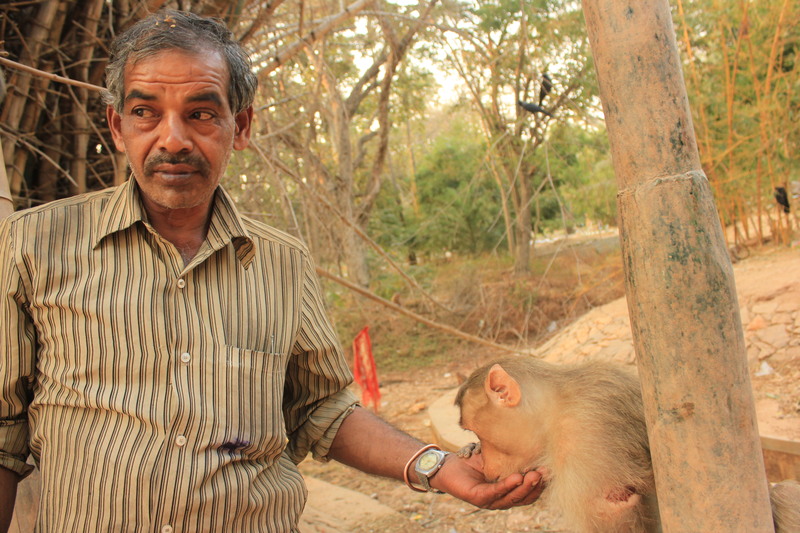 I was really touched seeing this friendship between a man and monkeys and that too a man from such a humble background. 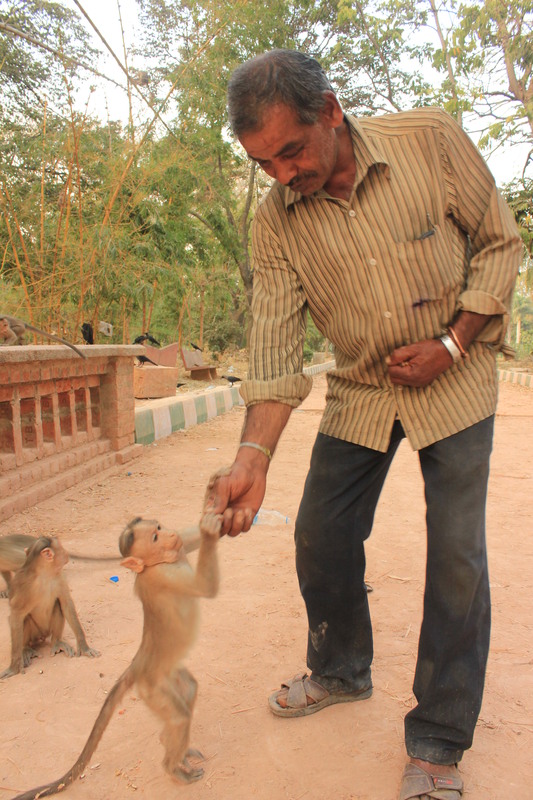 I would call Shivashankar the Santa of these monkeys. May his tribe increase! 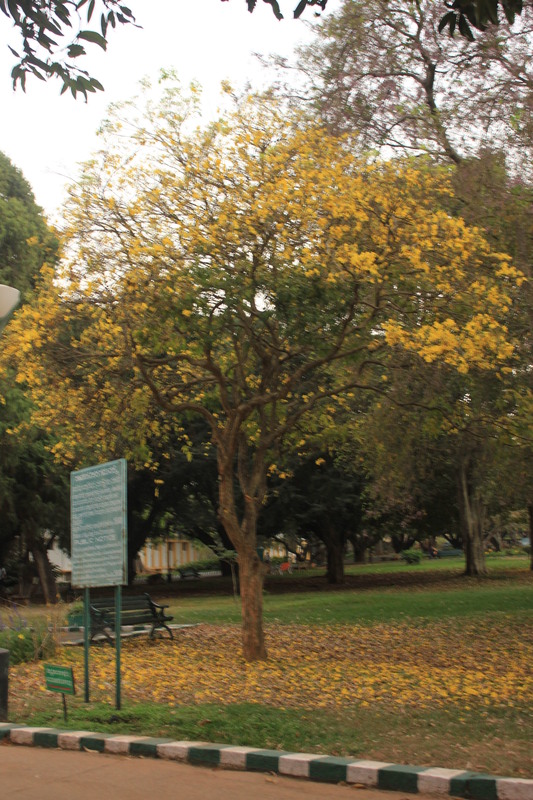 The month of love is a lovely time to visit Lal Bagh. 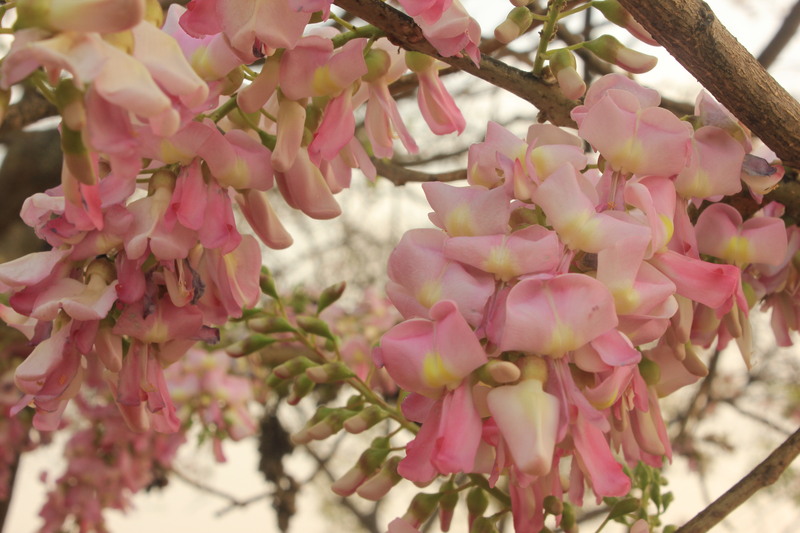 The weather is great, so many trees bloom and the air is filled with a mélange of sweet fragrances. 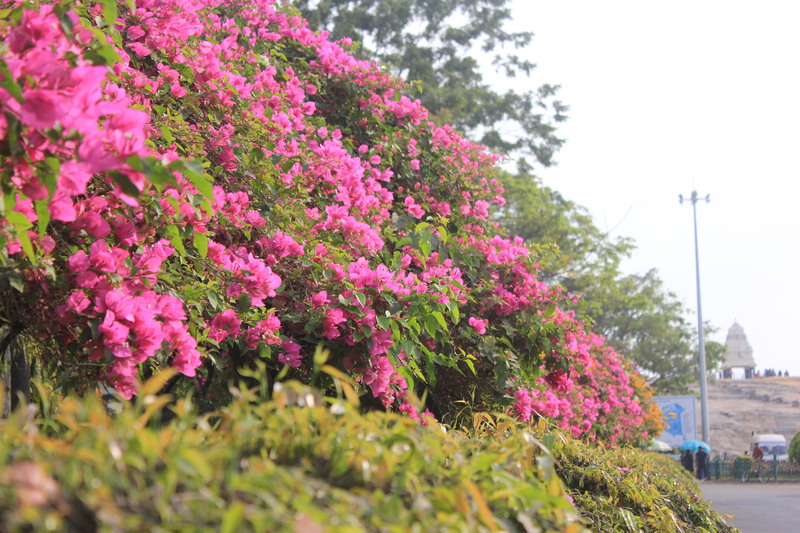 As I walked in through the gates I was greeted by the canopies of bougainvillea that covered the footpaths on either side. 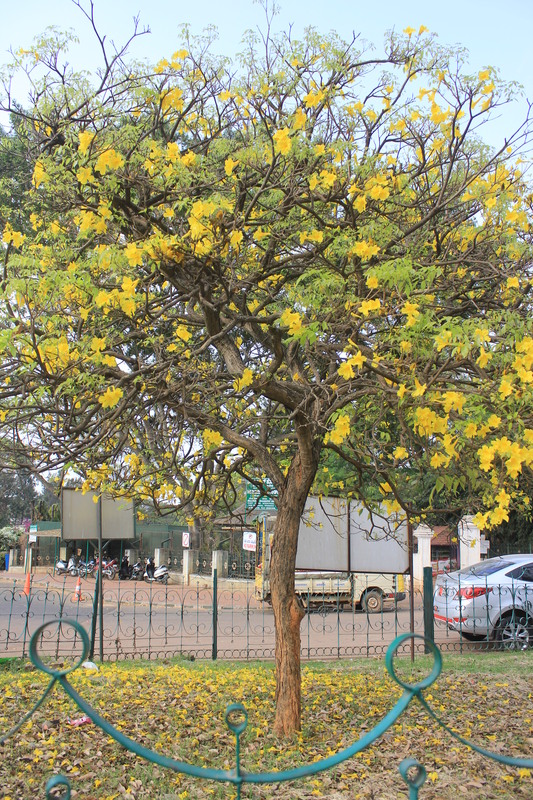 I found it difficult to take my eyes off these yellow blossoms at the parking zone. 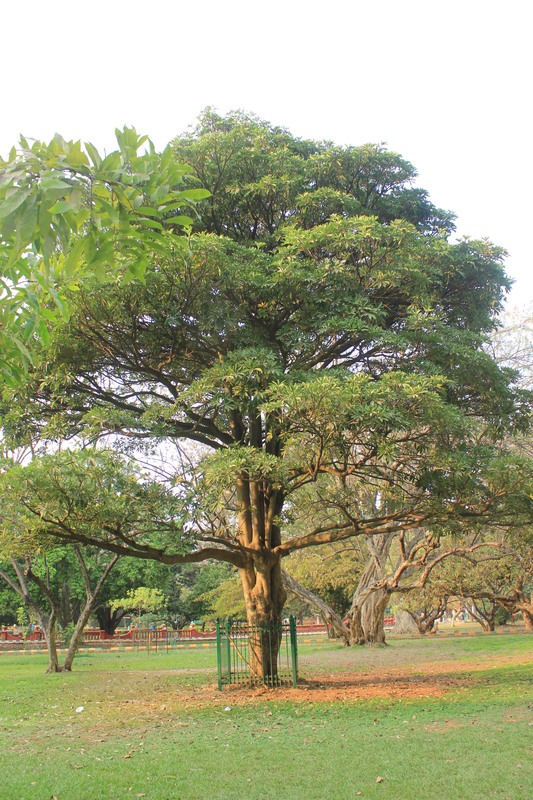 At the foothill of the famous Lal Bagh hillock the Moulmein Rosewood trees were in full bloom. 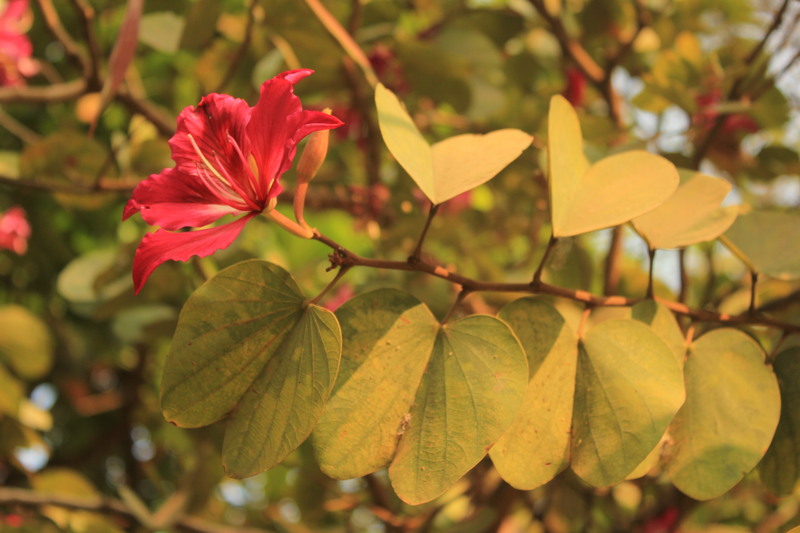 Vying for attention with the mauve beauties was the Mother of Cocoa tree. Trees are such great creations of God. They look so beautiful even when they are leafless! 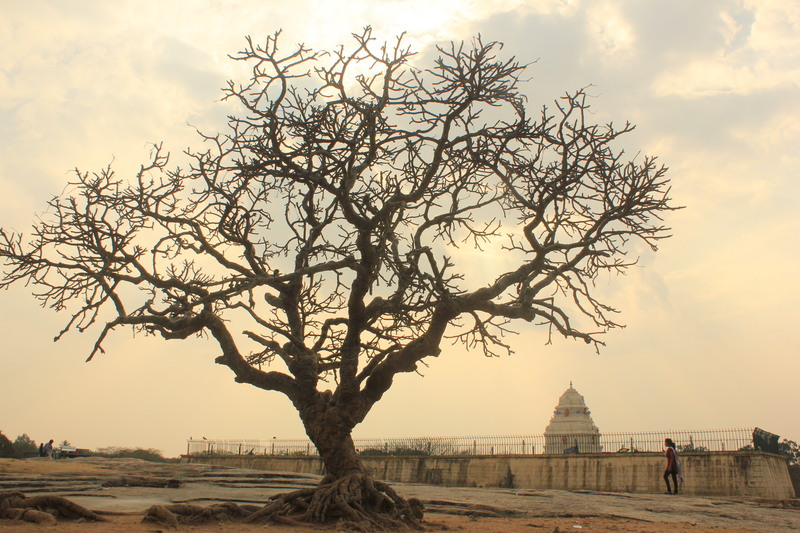 As I climbed up the hillock I noticed this tree standing tall amidst a cluster of rocks. Great place to meditate I should say! 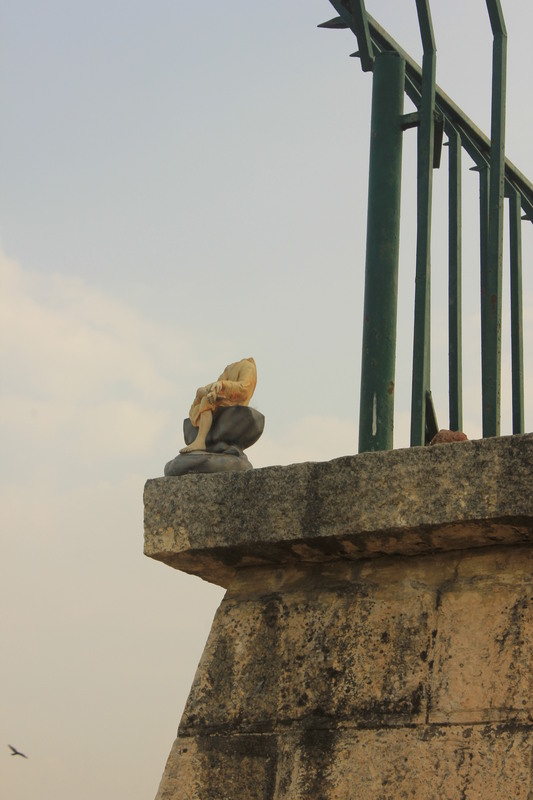 On the wall surrounding the Kempegowda Tower I was taken aback when my eyes fell on this headless statuette. Wonder who kept it there and why?? 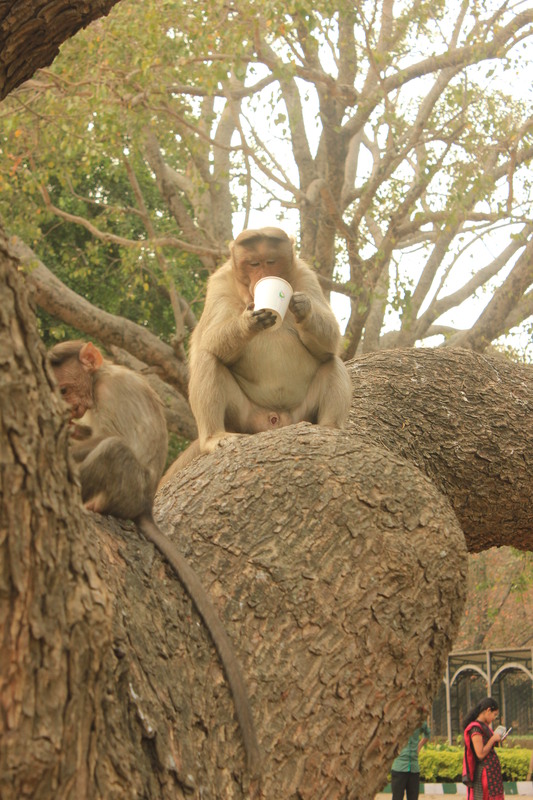 A group of monkeys seemed to be having a tea-party! 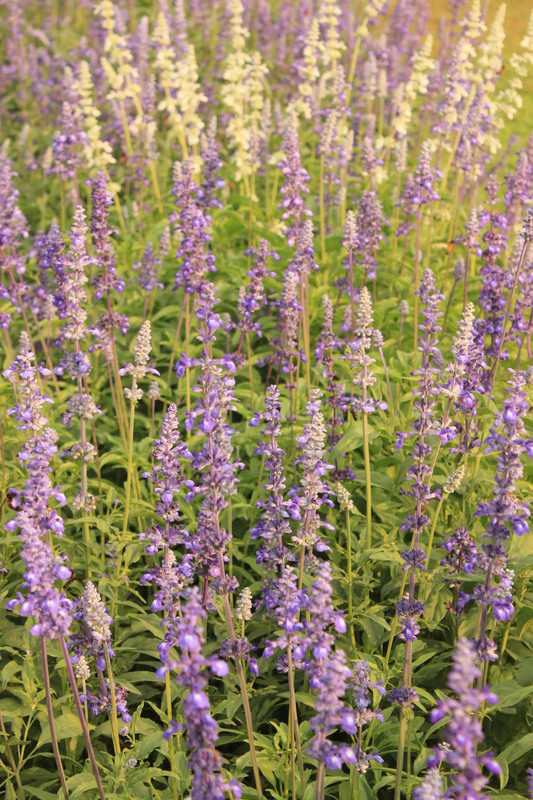 Purple blossoms and plenty of them! 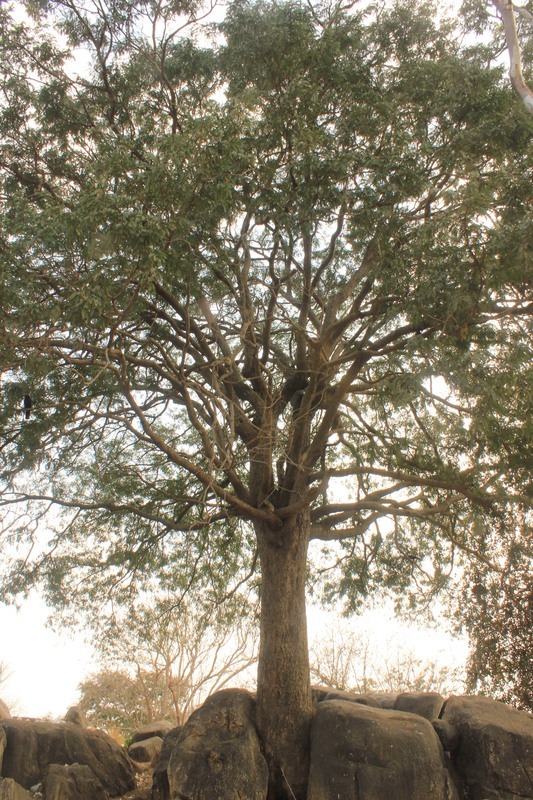 Till I saw it yesterday, I didn’t know of a tree called the Devil’s Tree. There’s nothing devilish about the tree though. 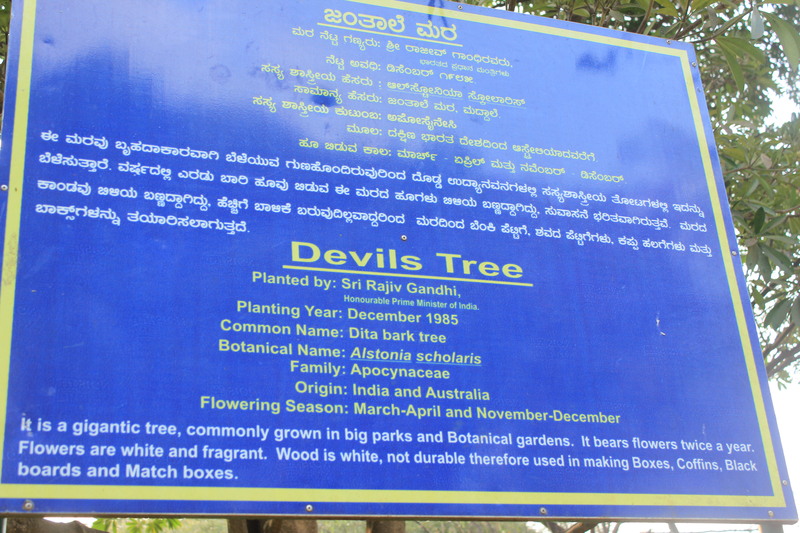 It was planted in 1985 by the then Prime Minister late Rajiv Gandhi. As I walked on, I spotted this beautiful bird bath. I have been to Lal Bagh several times but I can’t recall seeing it. 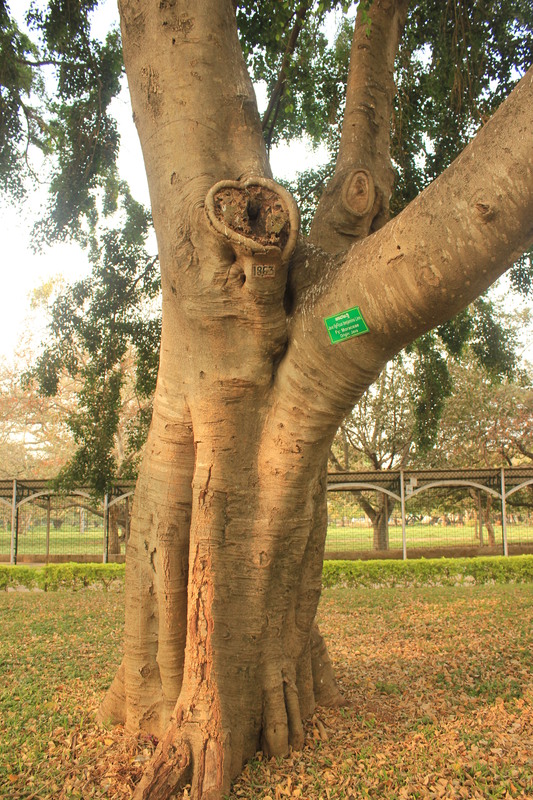 Nothing to be surprised about as each visit to Lal Bagh has led to new discoveries. 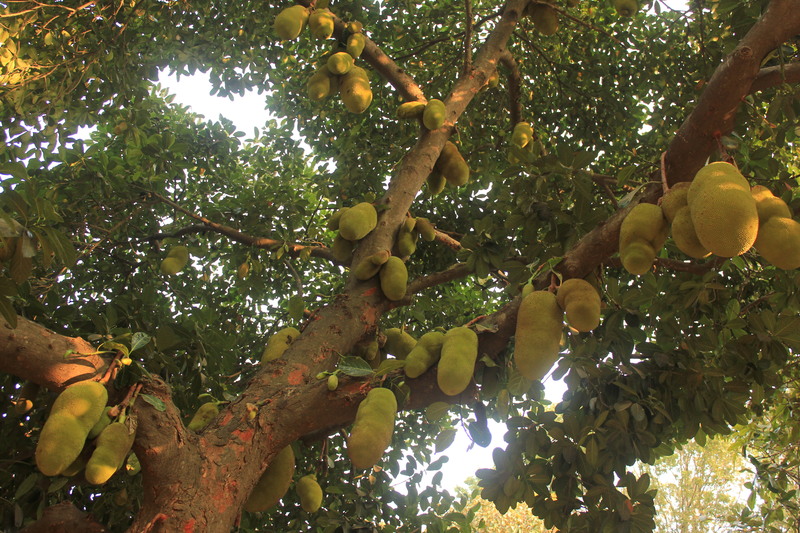 And what do I see next, a Jackfruit Tree laden with fruits. Wow! If only I could lay my hands on one of the bigger fruits. 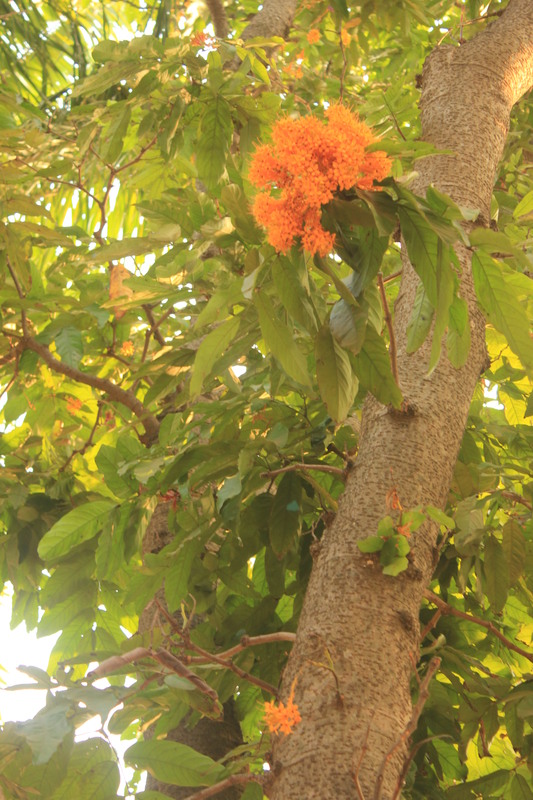 And this is the Saraca thaipingensis, a tree of Malayan origin. As dusk was gradually beginning to envelope the gardens, and birds were returning to their nests, I bade goodbye to my favourite green space in the city. But not before one final click of the Tree of Gold.